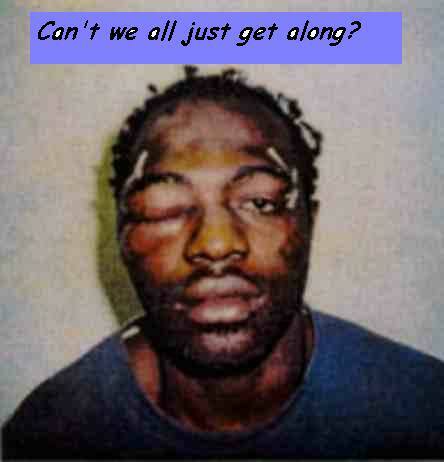 Clarification: (Why) can(’t) we all (just) get along? There is a reason for this. Like many people, I’ve been carrying the quote around in my head all these years as “Why can’t we all just get along?” But as I discovered to my chagrin yesterday, if you go to the video tape, “Can we all get along?” is the actual phrase. This is too bad, because while the former is more pleasing to the ear and the sensibility, all the latter has going for it is that it is accurate. This quote is often mistakenly attributed to leading Nazi Hermann Goering, or occasionally to Julius Streicher, a lower-ranking Nazi. This misattribution may date from the famous Frank Capra documentaries (Why We Fight) shown to American troops before shipping out. In fact, it is a line uttered by the character Thiemann in Act 1, Scene 1 of the play Schlageter, written by Hanns Johst. The association with Nazism is appropriate, as the play was first performed in April 1933, in honor of Hitler’s birthday. Does that now make it OK for me to paraphrase this line in polite company, by way of explaining how I feel about Facebook? Or should I refrain? I won’t lie to you: It’s nice to be back where electrical outlets are shaped normally and people have the Courtesy to Speak English. Though to be fair, many people in Austria — where I just spent eight busy days — did have the Courtesy, or at least the capacity; it’s just that I was afraid to ask them to because I have a complex about being a bumbling monolingual American. There is an Irish pub in Graz called Flann O’Brien’s that was “built on the Emerald Isle by the finest of Irish craftsmen and was shipped piece by piece” to Austria. Do you believe that? Why not? Just order what Barbara orders. A surprising number of restaurants in that part of the world don’t take credit cards. Carry cash or you may find yourself in an embarrassing situation. White asparagus does not make your pee smell funny. There are hedgehogs living in the park in Graz. Hedgehogs! Powered by WordPress v 5.1.1. Page in 0.114 seconds.